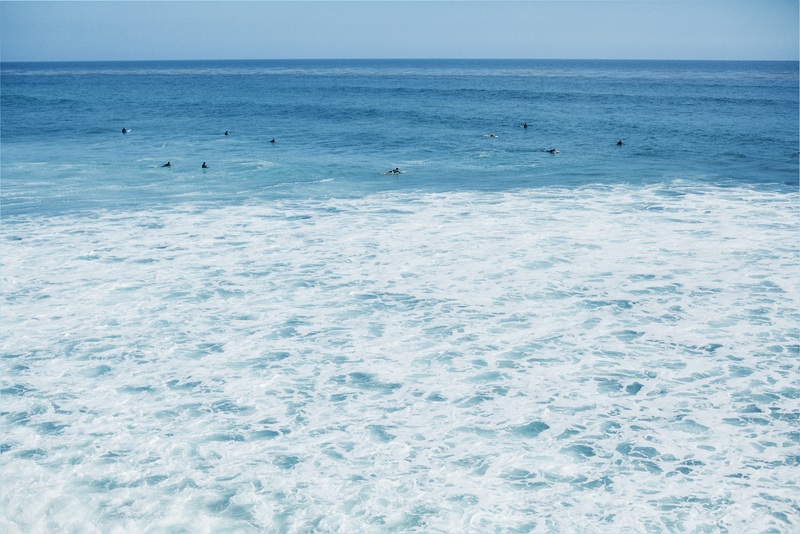 Last summer, we invited a group of friends and tastemakers to join us at a charming A-frame beach home near the location for our Malibu Barbie cover story featuring glowing-skinned influencer and model Jasmine Sanders. The undeniable theme was to be, of course, the dazzling beachfront sunset. And with that, we began dreaming up all the pastel colors that would pair with the gorgeous August sky. A table set atop the wooden outdoor deck overlooking the Pacific was decorated with hydrangeas and clean, white dishes on an abstract striped tablecloth. 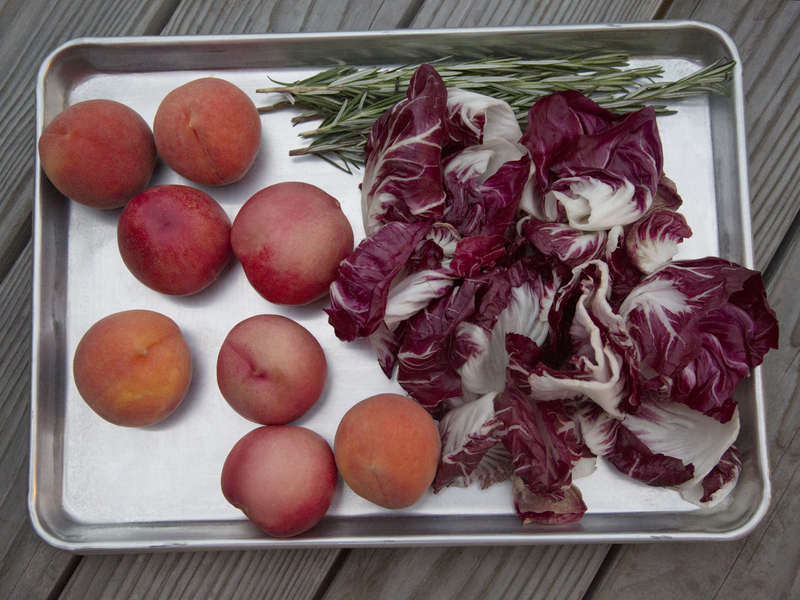 Farmer's market produce and bold, delicious colors were the sources of inspiration for Alicia Liu of Lavender + Truffles, our friend and go-to for catered meals that are as visually pleasing as they are tasty. Seasonal fruits, modern charcuterie, and a "Violette" summer cocktail were amongst the light summer offerings. Liu even created a refreshing cucumber gazpacho to fit our color story. The ocean breeze was our bonus accessory for the night, with the sound of waves crashing as our soundtrack. As the sun went down and the candles began to flicker in the evening air, the serene colors of the decor only became more beautiful. WHAT: turquoise and pale blue bowls and trays, large goblets, pink hydrangea, unscented colored glass votive, turquoise-striped dish towels, confetti-specked cocktail napkins, striped straws, an orange and pink linen tablecloth, white-handled servers and marble trays. WHAT: Red, pink and purple radishes with pasta and peas; plums & grapefruit slices with radicchio, prosciutto, coppa, mint and dill; burrata spread with peaches, nectarines, feta, and mixed greens, cucumber gazpacho, blackberry mousse; and a purple-hued vodka and gin cocktail. 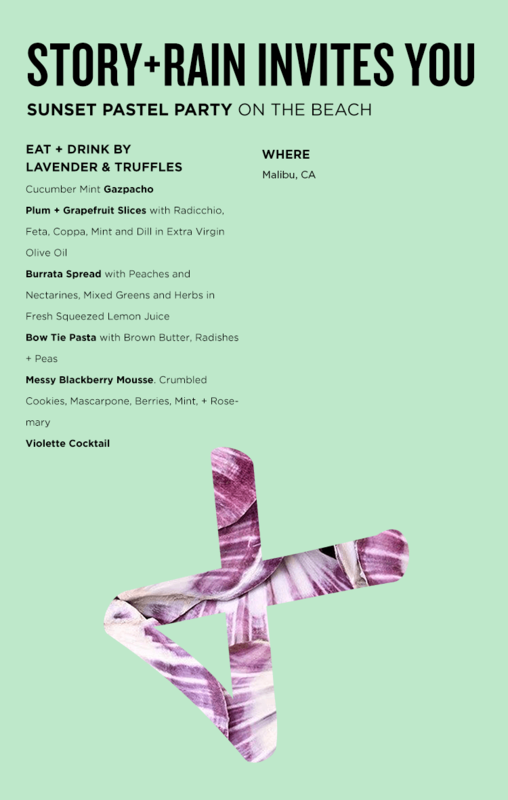 The menu was inspired by farmer's market produce and brightly colored fruits and vegetables. Alicia Liu of Lavender + Truffles blends up chilled cucumber gazpacho. Pastel accents made up the decor, right down to the details. 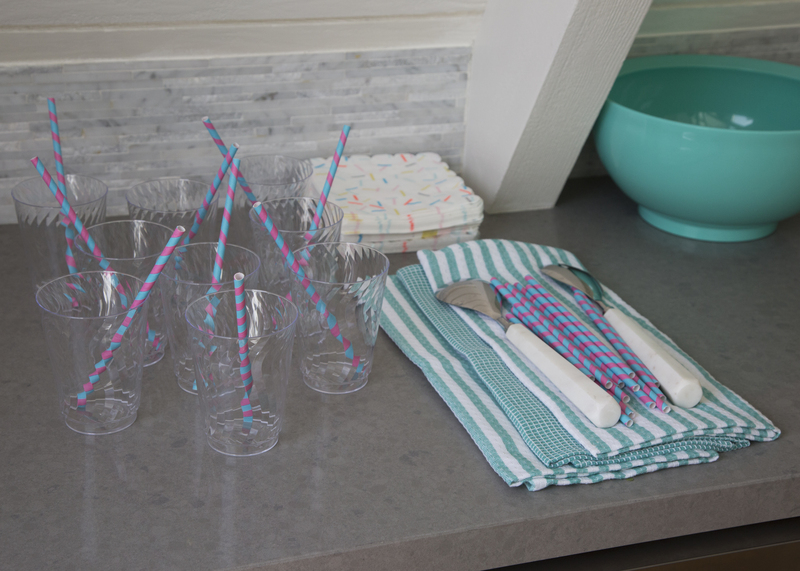 Straws, cocktail napkins—even dish towels—kept with the color scheme. 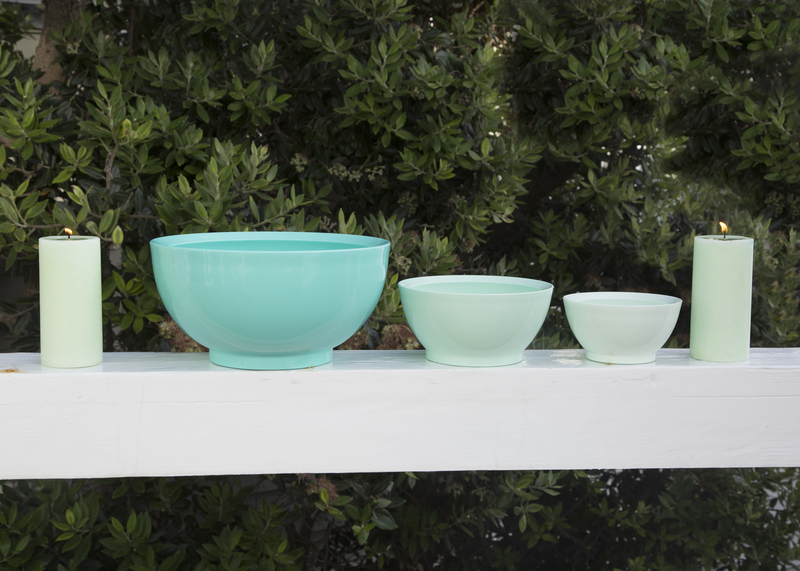 Melamine bowls held nuts, snacks, and salads, and are ideal for entertaining outdoors. 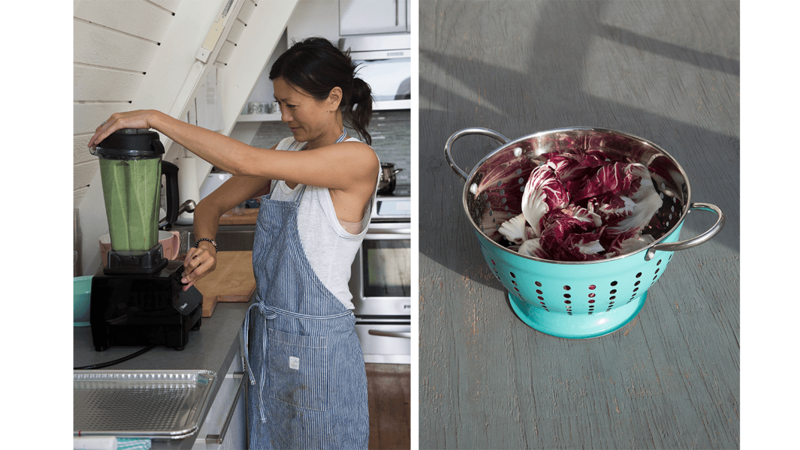 Toss the mixed spicy greens with radicchio with juice from the two lemons, extra virgin olive oil, black pepper and Maldon sea salt, all to taste. 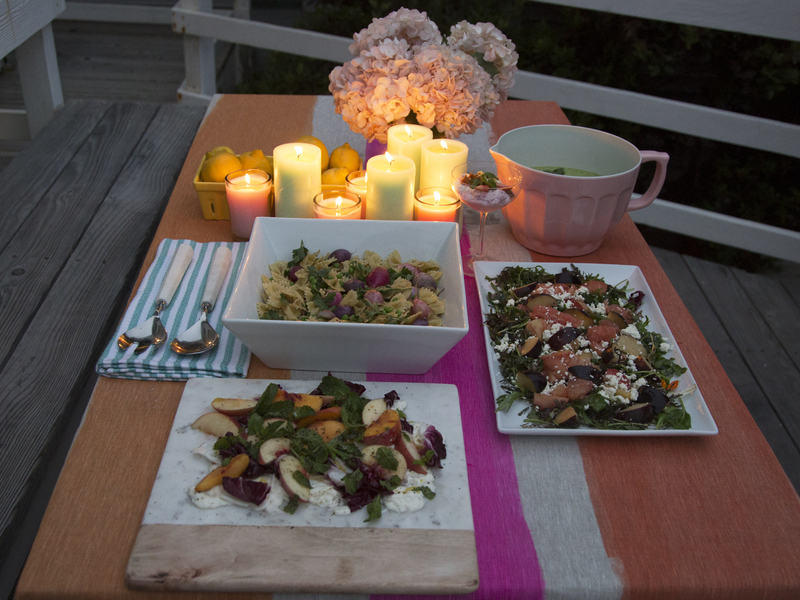 On a large platter, layer the mixed greens and sprinkle the plums, grapefruit, mint, dill and feta cheese. Continue another 1-2 layers. Sprinkle extra virgin olive oil, black pepper, and Maldon sea salt over the entire salad. Serves 4 servings, 8-10 oz. Slice radishes in half and lay flesh side down on baking sheet. Bake at 325° until tender. Bring a pot of water to boil with salt and drizzle olive oil. Add pasta until al dente. Drain pasta and set aside. In a small sauce pan, melt butter over high heat until butter turns brown. 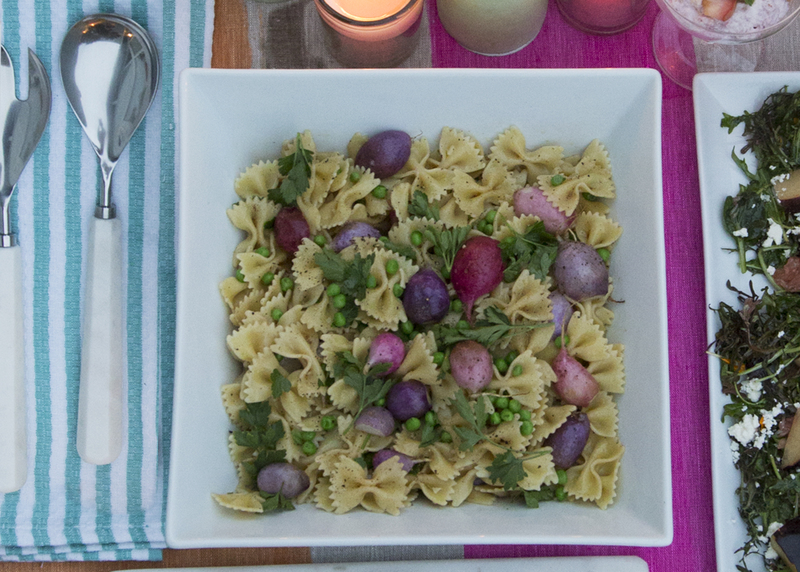 In a large bowl, toss pasta, radishes and peas with olive oil, salt and black pepper all to taste. Add brown butter over pasta and serve while hot. Toss the mixed greens with juice from the two lemons, extra virgin olive oil, black pepper and Maldon sea salt, all to taste. Break burrata balls and spread on a large rectangular platter. Layer the mixed greens over the burrata and sprinkle the peaches, nectarines, basil and parsley, but keep some burrata exposed on the bottom. Continue another 1-2 layers. Sprinkle extra virgin olive oil, black pepper and Maldon sea salt over the entire salad. In a small bowl, sprinkle the gelatin over 1 tablespoon of the water and let stand until softened, about 5 minutes. In a blender, puree the blackberries with the remaining two tablespoons of water. Strain the blackberry purée into a small saucepan; there should be about 3/4 cup. Add the sugar and bring to a boil. Simmer the blackberry mixture over moderate heat, stirring occasionally, until it is slightly reduced, about 5 minutes. Stir in the softened gelatin until dissolved. Let the mixture cool. In a medium bowl, using an electric mixer, beat the egg white until firm peaks form. Using a rubber spatula, fold in the cooled berry purée until no streaks of white remain. In another bowl, beat the heavy cream until softly whipped. Fold the whipped cream into the berry mixture and refrigerate until chilled, about 1 hour. In a small saucepan, combine the water and sugar and bring to a boil. Remove from the heat. Add the lemon zest and let stand for 30 minutes. Strain the syrup into a cup. Wipe out the saucepan and return the syrup to it. Add the blackberries to the syrup and bring to a boil. Reduce the heat to low and cook, crushing the blackberries against the side of the pan, until the liquid is slightly reduced and the berries have broken down, about 15 minutes. Strain the syrup into a heatproof cup without pressing. Refrigerate the syrup until chilled. In a deep coupe or brandy glass, scoop mousse into the glass, then a small scoop of mascarpone cheese. Drizzle the blackberry syrup and top with crumbled lemon, fresh whole blackberries and lemon zest. Top with fresh mint leaves. Build ingredients in a cocktail shaker with ice. Shake until chilled. Stir and strain into a small coupe. Garnish with lemon zest. Mix all ingredients in blender on high until mixed through. Drizzle olive oil to thin soup. Mix at low speed until desired consistency. Add salt and black pepper to taste. Garnish with mint or parsley.